Local Ulster Society ACE workers Inez Thornton, Bryan McCutcheon and Sharon Atkinson with Lynda Brown from the Society's Lurgan headquarters and Dr Philip Robinson who delivered a lecture on the Plantation of Ulster at the Highways in Larne. 1989. The Hamilton Team in the Larne High School production of 'Ham' - Jonelle Clements, Naomi Smyth, Jane Robiinson, Lisa Shaw, Adrian McCourt and Jennifer Murray. 1989. Jaye Birkenhead was first in the working hunter class and Reeve Birkenhead was second in the lead rein on Mountshilling Spitfire at the Gymkhana at Magheramorne. 1989. Fifth year pupils from Larne High School who successfully ran a branch of the Northern Bank during their lunch times. They took on roles of bank manager, cashiers, computer operators in inquiry staff. Imcluded are Margaret Lindsay (extreme left) and Lynne Milligan who were in charge of the project. 1989. 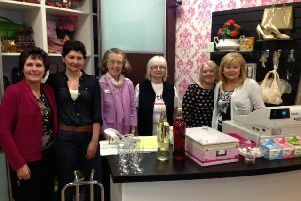 Diane Saunderson (centre) with The Hamilton Girls, Angela Hunter, Fiona McCord, Amanda McCooke and Maxine Mitchell. who performed in the Larne High School production of 'Ham' 1989. 'The Baddies' in the Larne High School production of 'Ham'. From left: Graeme Murray, Alison Kane and Alan McGuffog. 1989.